The specification of this bike, along with the mid-range price tag, makes this Carrera Kraken Hard-Tail Mountain Bike an appealing prospect for many riders, especially when Mountain Biking UK say it is probably the best they have tested in the price range, but what do real users have to say? What benefits can this Carrera Kraken MTB offer for mountain biking and cycling in general? The reviews for this Carrera Kraken Mountain Bike have been full of praise, so much so that the question “what do you like about this bike?” has often been met with one simple word – everything. While this is encouraging for prospective buyers, it does not tell us an awful lot about the product so what exact benefits have been highlighted? The first area to discuss is the fact that it so easy to ride and most users get pleasure from the performance. This is partly due to the light weight of the bike – which is just 13.8kg – and the sturdy nature of the construction but it is mainly due to a highly recommended specification. Among these advantageous components are the high-quality suspension, strong tyres that can easily handle the off-road conditions and the ability to switch through 27 gears with smooth transition. Additionally, buyers of this Carrera bike cannot help but agree with the idea that it is great value because of the high spec and mid-range price. Does this well-loved Carrera Mountain Bike have any flaws to be wary of? As you may expect given the nature of the positive reviews, there are much fewer negative posts and moments of criticism. However, there are some disadvantages and areas with mixed reviews. One of these areas where opinion is divided is the design. Some people like the minimal, black and white look but other feel that it lacks imagination and that there should be more choices available that just “satin ice white”. The seat, on the other hand, is a feature that receives strong criticism for its lack of comfort and padding, but this is not a major problem for most people because it easily be replaced with a better model. 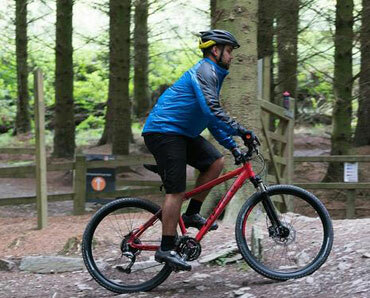 Summary: is this Carrera Mountain Bike really a worthwhile purchase for keen cyclists? In short, it seems that online reviewers were right to place their good recommendation upon this mtb because the majority of users reviews back up their idea that this is great value, mid-range bike with a surprising performance and specification. There are some minor issues with the comfort of the saddle and the design is not to everyone’s taste but there are plenty of advantages with the gears, frame and tyres that make this bike a great buy. 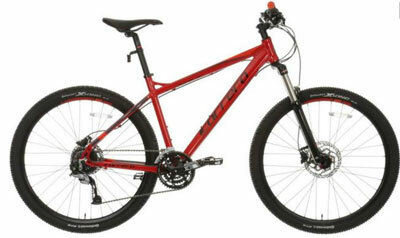 Find more reviews about this Carrera Kraken Mountain Bike at Halfords here.